Aztech Cutting Solutions is one of the leaders in profile cutting in Australia. This page is designed to answer some common questions about our tools and techniques. If you have any further inquiries please do not hesitate to contact our friendly team! How does waterjet cutting work? The waterjet cutting process involves two main stages. Firstly, an intense pressure pump or Electric Servo Pump elevates regular tap water to pressure levels above 40,000 psi (2760 bar) to produce the energy required for cutting. Next the water is diverted into a small precious stone orifice to create a high-powered jet stream. This has a velocity of roughly 2.5 times the speed of sound, which may vary depending on how the water pressure is exerted. This process is effective for both water only applications as well as abrasive jets. For abrasive cutting tasks, abrasive garnet is loaded into the mixing chamber of the cutting head body. The result is an extremely direct and powerful abrasive jet stream. How much speed and accuracy does a waterjet have? Speed and accuracy can vary according to the texture and thickness of the materials that you are using as well as the cut quality desired. For rubber and gasket cutting, we have waterjet machines whose motion capabilities enable traversing at 2.54 to 76,200 linear mm per minute. Technijet provides software which can reliably calculate the optimal cutting speeds for a wide range of materials. To ensure a precise result our team will gladly perform test cuts on a sample of your chosen material. The cutting speed is influenced by variable factors such as the type of edge quality required. Factors including the quantity of abrasive, the cutting pressure, size of orifice and focusing tube, pump horsepower and so on, may be tweaked to achieve the desired results. We can tailor our services depending if speed or the most precise cut is of greater importance to the task at hand. How thick can my materials be? The capability of the waterjet cutter varies according to the softness or hardness of the material being cut. The usual range is between 0.2mm and 150mm thick. Hard materials are usually cut within a 1mm to 120mm range. Stainless steel or stone with a greater thickness can, however, be cut with a waterjet under certain circumstances. A successful result depends on the purpose for which cutting is done (for example prototype or production) and the unique system operating conditions. What gives waterjet the edge over other cutting technologies? 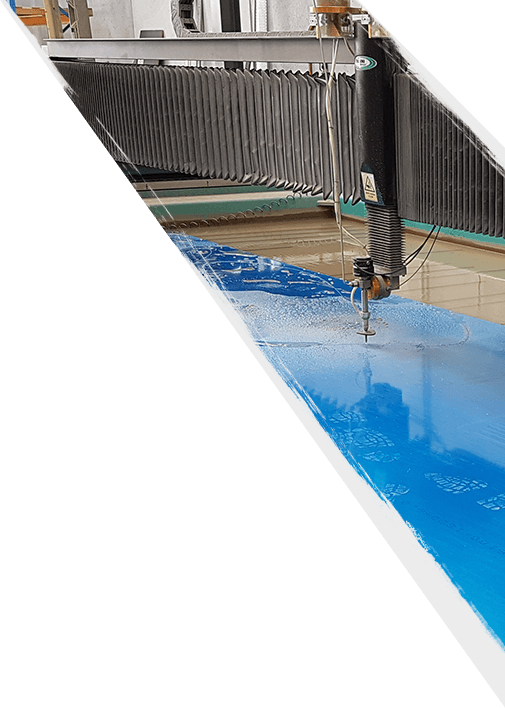 Waterjet technology affords many more cutting possibilities and thus enhances the flexibility and versatility of your manufacturing processes. Waterjet delivers results with unparalleled reliability and accuracy. As cold water is used the material being cut does suffer from heat exposure Debris are eliminated by water thereby reducing hazardous gases and offering an alternative, which unlike other cutting processes, is kind to the environment Fragile materials such as glass and stone can be safely cut with ease Plastic materials may be cut without producing noxious fumes Can perforate most materials without the need for starting holes Minimises wastage of raw materials due to the small cutting kerf width Composite materials can be cut without any special treatment Plus many more! What types of materials are suited to the waterjet cutting process? We can work with both hard and soft materials including, but not limited to titanium, stainless steel, aluminium, munitions, exotic alloys, composites, stone, marble, floor tiles, glass, automotive headliners and door panels, gasket, foam, rubber, insulation, textiles, food and many more. Soft materials are cut with water only. If your materials are hard we will use a stream of water combined with fine grains of abrasive garnet. Will waterjet technology effectively cut my material? Are there any limitations? The properties of certain materials do not lend themselves to being cut using waterjet processes. Many fabrics are difficult to cut as the fibres often become twisted during cutting rather than remaining firmly in place. However, the most problematic material for the waterjet process is pipe. Any material which demands that the waterjet cut through one layer, cross a void, then cut through another layer unfortunately does not produce desirable results. The cutting stream cannot remain completely linear after cutting through the upper layer, which results in poor edge quality on the remaining layer(s).